Kathrin Kranz, a doctoral candidate in the Kroc Institute for International Peace Studies, recently received one of the Nanovic Institute's Dissertation Fellowships. But before that, she received a Graduate Break Travel and Research Grant for winter break travel to Germany. There she conducted interviews as a part of her dissertation field research, and her funding made all the difference. Read about her experience in her own words! I arrived in Germany at the height of the holiday season, a wonderland of Christmas sights and sounds. It was, in short, a beautiful time of year to begin my dissertation field research, nine days of which were generously funded by the Nanovic Institute. The main purpose of my trip was to interview experts and policymakers on the topic of arms embargoes and changing European arms export norms. While I had already collected archival data as well as government documents and media publications, I needed to conduct interviews to understand the informal dynamics of policymaking that are often difficult to deduce from written sources. Having set up some interviews before getting to Germany, I started my journey in Bonn. During the course of my first meetings, it soon became clear that in order to meet and speak with insiders, I needed to be flexible. Because the holidays had just ended, many of the people I planned to interview were in different locations than they usually are, or were busy catching up with their work. 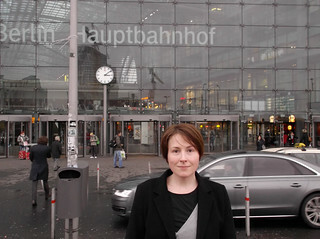 And so, I spent a good deal of time on trains, traveling all over Germany to meet with experts, government consultants, civil servants, and members of Parliament (luckily Germans trains are comfortable and punctual, and have quiet wagons that are great working environments!). For this, the generous funding from the Nanovic Institute proved invaluable: it allowed me to be flexible, to change my travel schedule—often at the last minute—and to make my way to several locations without having to worry about whether or not I could afford the next train journey. As a result, I met many of the experts and policymakers who are central to my dissertation research. I interviewed eight insiders during the nine days that the Nanovic Institute funded. It was a pleasure to find how welcoming people were, and how eager they were to help, despite their busy schedules. On more than one occasion an interview that was scheduled to last one hour turned into a conversation and a lunch, filled with anecdotes of work and of navigating the highly complex subject of the arms trade. The insiders’ accounts of German arms embargo politics and changing European arms export norms not only revealed some of the informal dynamics I was hoping to discover, they also changed some of the assumptions I had made. For example, one account of a European working group meeting described how civil servants from European Union member states come together to talk about each other’s approaches to determine the legality of potential arms transfers. This sharing of information, said the insider, influences how she views decisions, and has contributed in subtle ways to rethinking some of the ways these are made. This was just one account of how European cooperation has begun to affect member states’ arms export policies. The Nanovic’s Christmas travel and research grant not only allowed me to travel to Germany to conduct dissertation research, it also made it possible for me to make last-minute adjustments to my travel plans, which I would not have been able to afford otherwise. I was able to conduct eight interviews for my dissertation, which have enriched my thinking and findings. In addition, I was able to make valuable contacts for future research. I am very grateful for the support the Nanovic Institute has given me. It was a wonderful experience to meet some of the people who contributed to some of the decisions I have been studying from a distance.